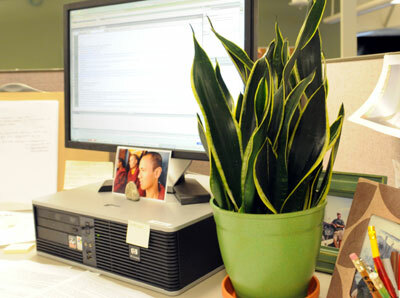 This rattlesnake plant, which I just added to my cubicle, is the secret to my increased productivity. Like many people, I spend a fair amount of time in a windowless office. If I stand up, I can see the windows, but when I’m seated, it’s just me, the PC and the coffee cup. Will anything grow inside these fabric-covered cubicle walls? The answer: Yes. Even if you work in a windowless office, chances are you can grow some sort of plant. What’s more, green plants have other benefits to the office denizen. Studies have shown increased productivity (12 perecent) and reduced stress (lower systolic blood pressure) in offices environments with plants. Participants in the study, conducted by Washington State University, also reported increased attentiveness when plants were present. Studies have shown that houseplants remove toxins from the air. There’s hope that indoor plantings might help relieve “sick building syndrome”, a condition found in many energy-efficient buildings. In a process called transpiration, plants release moisture, increasing humidity in winter-dry offices. Healthy plants make your office look sharp; your boss is sure to be impressed. Isn’t the Rattlesnake plant, also called Mothers’ In-Law Tongue? I have three of them, and they are great low maintenance plants! Yes, mother-in-law’s toungue = rattlesnake plant. The genus is Sansevieria. Dieffenbachia, also known as dumb cane, is an entirely different plant. Hola! I’ve been following your blog for a long time now and finally got the bravery to go ahead and give you a shout out from Dallas Texas! Just wanted to say keep up the great job! I have a ponytail palm in my cubicle that I’ve had for years and it flourishes here in the office. It is really huge now and I get so many compliments on it. Thanks for the other recommendations.